Famous For: first educator to offer a course in Psychology in the U.S.
William James was an American psychologist and philosopher. He had medical training and was responsible for the first psychology course to be offered to students in the United States. James is best remembered for his extensive writings, which ranged widely through subjects such as mysticism, pragmatism, religion, and several aspects of psychology. Henry James, the novelist, was his brother. 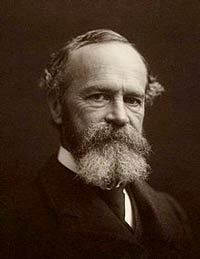 William James was born into a rich and comfortable family that regularly made visits to Europe. His father was fascinated by theological and philosophical matters, and he was determined that all of his children should receive an excellent education. As such, he ensured that they were enrolled in the finest schools and were given an extensive and wide-ranging introduction to art and culture. The young William hoped to be allowed to study art, but his father – otherwise very liberal – tried to persuade him to study philosophy or science instead. However, when the boy showed a continuing interest in painting, his father finally relented. James then spent a year studying art under William Morris Hunt. However, he decided that this was not where his future lay and obtained a place at Harvard where he took a course in chemistry. Unlike two of his brothers, William did not fight in the Civil War, as his health was not sufficient to allow him to do so. Meanwhile, his family was becoming less affluent, and so the James moved his studies to the medical school at Harvard, hoping that a career in medicine would better allow him to support himself. Becoming disillusioned with his new studies, James set out on an expedition with Louis Agassiz, a naturalist. He hated the experience, writing later that he felt “indescribably hopeless” at this time. His health continued to be poor, and he suffered from serious bouts of depression. Hoping that a change of scenery would benefit him, he traveled to Europe, living in Germany and France and studying psychology with Hermann von Helmholtz. Despite his unhappiness with medicine, he graduated from Harvard in 1869, but his depression then forced him into a listless and inactive state. As a way out of this inactivity, Harvard’s president gave James the opportunity to become an instructor at the university, an offer which he accepted. He would remain in his post there for more than three decades, during which time he founded a pioneering laboratory for the pursuit of experimental psychology, a concept which was still very new to American medicine. Even so, James was still learning. He once said that he had never heard a psychology lecture before he began to give them himself. In 1890, James published The Principles of Psychology. It received widespread praise, but some other psychologists were almost dismissive, seeing it as more literature than science because of its rather personal tone. Nevertheless, the success of the book encouraged James to publish a shorter version, named simply The Briefer Course, two years later. These both remained standard works for psychology students for many years. James wrote extensively about pragmatism, the concept that an idea’s ultimate truth cannot be finally proven. He suggested that, instead, the idea’s usefulness was more important in practical terms. He was not a supporter of structuralism and wrote that the impact on behavior of the environment must be considered. James also proposed the theory that emotion stems from how physiological reactions are interpreted. This is known as the James-Lange Theory of Emotion, as Carl Lange proposed the same theory independently.